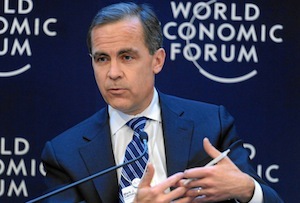 The Bank of England governor did his best 'tough teacher' on stage at Davos. The great and good of business, finance and politics (and, er, Will.i.am) have been airing their views on stage at the World Economic Forum in Davos this week and this morning was Mark Carney’s turn. The main takeaway from the Bank of England governor? Tech companies should pay more tax out of a ‘sense of responsibility to the system’. Tech giants from Apple to Amazon and Google have come under fire numerous times in the last few years for their tax arrangements, which in Europe most often involve diverting profits and/or sales through Ireland or Luxembourg. How can we tackle tax avoidance? - Read MT's feature on how to get companies to toe the line. It’s not just tech firms, though. Companies ranging from Credit Suisse and Accenture to Gazprom, GlaxoSmithKline and the Guardian Media Group have all had help from PwC and Luxembourg to cut their tax bills. Naming and shaming tax avoiders can help them discover a new-found ‘sense of responsibility’. Starbucks, for example, agreed to pay more corporation tax and even moved its European hq from Amsterdam to London after ‘listening’ to its customers. But tax avoidance is entirely legal for the most part – although favourable tax arrangements, as the EU has accused Apple of having with Ireland, for example, are not. Trying to take the moral high ground is all very well and good, but a simpler global tax system is what’s really needed. That’s clearly easier said than done, though. In the meantime, Barack Obama clamped down on US companies buying up British ones to take advantage of lower taxes last autumn, while George Osborne announced plans for a 25% levy on profits made in the UK and shifted abroad. How exactly the latter will work in practice is another question. But it's probably got more chance of succeeding than appealing to tech companies' better nature a la Mark Carney.